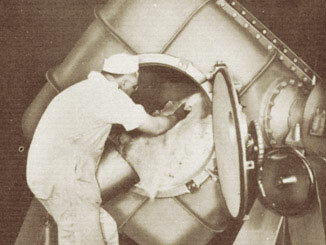 Our reputation for quality dairy products began over 100 years ago. 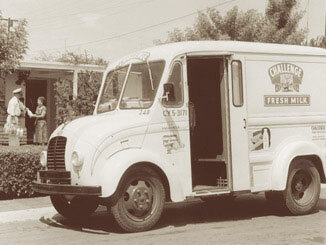 On January 2, 1911, The Challenge Cream & Butter Company opened for business in a rented storeroom in Los Angeles to sell the products of cooperative creamery associations in Riverdale and Tulare. The staff consisted of a manager, assistant manager, bookkeeper, and delivery salesman. Four people. 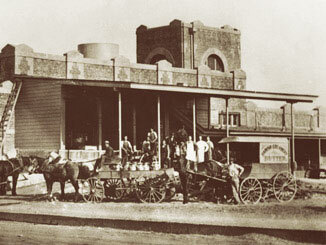 The new company owned a wagon but had to rent a horse to pull it. #1 Challenge Butter is the largest selling brand in the West. 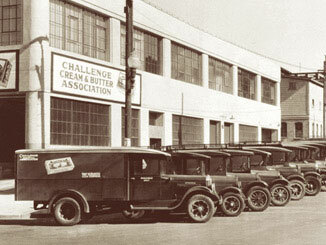 By refusing to sell any butter that did not meet the highest standards, Challenge built a reputation for quality throughout the Western States. 100% 100% natural, without the use of the synthetic hormone rBST. There’s a growing consumer awareness and demand for natural products, and that’s fine with us. We’ve been 100% natural from the beginning. 1911 Quality dairy products for over 100 years. Our dedicated dairy farmers and employees have maintained a tradition of quality and exceptional service since our inception in 1911. 600 Cooperative association of more than 600 family-owned dairies. Challenge Dairy Products, Inc. is a wholly owned subsidiary with California Dairies, Inc., (CDI) and represents over 600 dairy farm families. The legend behind the Challenge name. 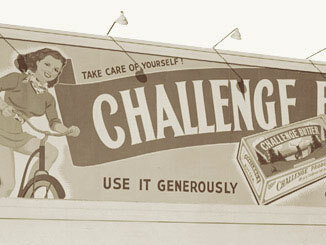 Legend has it the company name "Challenge" was selected by the first President of Challenge Cream and Butter Association, J.P. Murphy. Over dinner, he studied a mural on the wall that showed two elk coming together to spar for the position of "king of the forest." Under this mural were the words, "The Challenge." At the time, Mr. Murphy felt that this was exactly what he and the dairymen he represented were trying to accomplish. 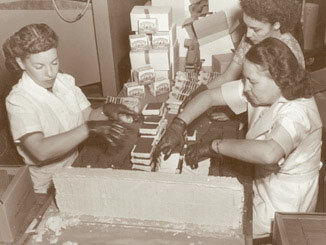 They were challenging the other dairy organizations with a product that was known for its quality. The founders of the Challenge company believed a commitment to quality, and the consistent delivery of that quality, could build a reputation that would endure. As we start our second century, our greatest asset is what we have stood for over the past 100 years, and we are committed to safeguarding our legacy for the next generation. Dairy farming is a way of life, and for California dairy farmers everything has to be put to good use. From developing reusable forms of energy to removing synthetic hormones, we feel the highest quality products are also the most natural products. Challenge Dairy has created great tasting and healthy products for school meals, emergency preparedness, athletic events, field trips, and school breaks. All products meet school board requirements and are delivered directly to schools in California. We are committed to the production of dairy-based food products, therapeutic powders, and ready-to-use therapeutic food (RUTF) to help treat severe malnutrition and meet humanitarian needs both domestically and internationally.